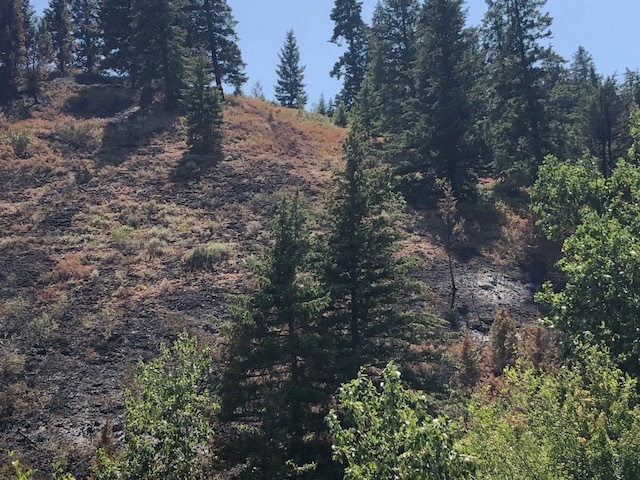 Monday, July 30, 2018 9 a.m.
Summary: Several days of hard work by firefighters have increased containment to 84% July 30. The fire has not grown in three days. It remains 17,600 acres with most of the fire area cold. The northeastern corner of the fire in Keithly Creek remains uncontained. Three handcrews are working to cold trail the area to ensure there is no remaining heat in the fire area. A resource adviser has spent several days with firefighters identifying fences and dozer lines to repair. There is extensive repair work in Keithly Creek area that requires a couple more shifts for heavy equipment to repair. As they complete this work, containment will increase with full containment expected by the end of the week. This is the final update for the Keithly Fire unless significant activity occurs. 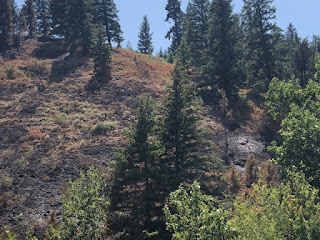 As of Tuesday July 31, please direct questions about the Keithly Fire to the Payette National Forest Information Line at 208-634-0820. Outlook: Operations staff are diverting resources to the Mesa and other area fires in greater need of equipment and supplies. The remaining resources assigned to the Keithly Fire will focus on repairing containment lines, repairing fences and monitoring the fire to ensure dust devils do not reignite the fire. Due to the decrease in operational tempo and resource demands, a transfer of command from Great Basin Incident Management Team 5 to a smaller incident management organization will occur Tuesday, July 31. This organization will manage the repair work necessary to complete repair work. Tuesday, the Incident Command Post in Weiser will break down, freeing resources and other supplies for other area fires. The Team extends our appreciation to the community for their hospitality and support the past four days while working from the Weiser High School. Weather: Incident meteorologists are forecasting hot, dry conditions through the week. There is a slight chance of thunderstorms Monday evening that may bring erratic winds. If new fire starts occur, these conditions will promote very aggressive fire growth.